As explained before I first thought OlliOlli looked like an endless runner with a skateboard but it’s so much more than that. Firstly levels have an end point and the aim is to make it to the finish without stacking big-time, by pulling off tricks and grinding, and nailing the landing. Achieving challenges to open up a harder (Pro) variant of the level. So far so similar to OlliOlli. The first thing that struck me was the training worked better and when I hit the first level it looked noticeably better. There appears to be more layers of parallax and the skaters animations are subtly improved, including the bails which are more painful looking that ever. There’s subtle touches such as birds dispersing from objects as you skate / grind towards them. There’s a nod to JJ Abrams with a clever use of artificial lens flare, and a train traveling in the background on the Wildwest level. So as you would expect for a second game, OlliOlli 2 appears to be an iterationally improved sequel until you hit the second area and you’re taught a new trick Manuals. The addition of Manuals refreshes the formula and the game becomes a totally new experience and increases the chances of perfect running a level from start to finish. On the previous game the skill of scoring relied on tapping X at the right time of landing to score based on how accurate your timing was from Sloppy to Perfect. Now to tap it with a direction either right or left to perform either a nose or rear wheel manual. Which can be tricked out of, either into another manual or on to a grindable surface. Later you’re taught how to Switch Grinds which is actually really tough and I’m finding it a bit hit and miss but I’m sure with practice it’ll click like getting the knack to perfect lands / grinds / manuals. There’s also reverts and revert manuals that switch your lead foot as you land. Thankfully the Skatepark is on hand to practice all the moves required and dings a bronze trophy for clearing all the tutorials. There’s a plethora of smoothly animated new tricks to learn and the first games Trickionary is back and bigger, showing how to perform them and an indicator to show if you’ve managed to pull it off. As returning is the horrendously unforgiving Daily Grind that can be practiced as many times as you like but once you play for real you’d better nail it cos you won’t get another go. Other than 5 new beautiful themed another major change is that some levels have multiple routes. Previously you could grind higher paths but now they diverge, some requiring greater skill to access than others. One of these on an Aztec level is where I spotted another change. No longer do you have to hunt for illusive hidden skateboards, now you have to find the 10 Roll 7 developers. I managed two find on my first PS4 playthrough HERE. 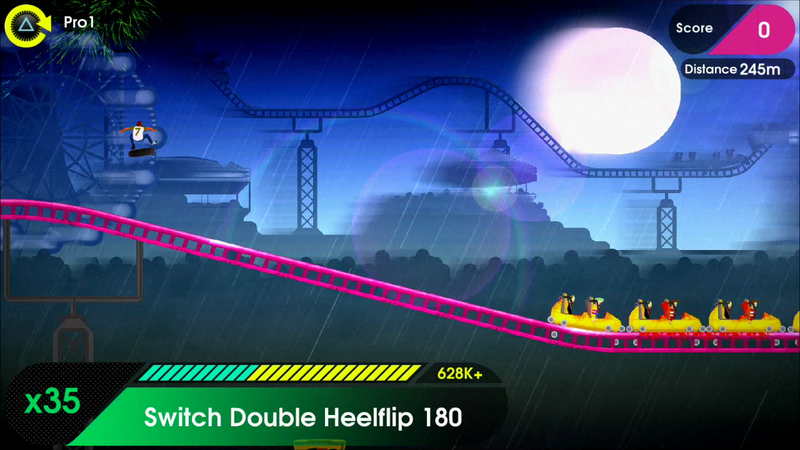 The look of each themed level is fantastic and the launch ramps are a nicely rewarding touch. Giving some big air and are essential later for being able to clear obstacles or reach grinds successfully. The game has the same set up: Make it to the levels end without faceplanting to open the next one. Clear the 5 challenges within the level and open a Pro version, with new challenges too. Also level completions opens up a Spot version of the level where the aim is to set as big a score as possible. And now has a combined Spots score based on all your highest achieved scores. OlliOlli I compared in my review to SSX on PS2 due to its one more play / I can get a better score and downhill fun. 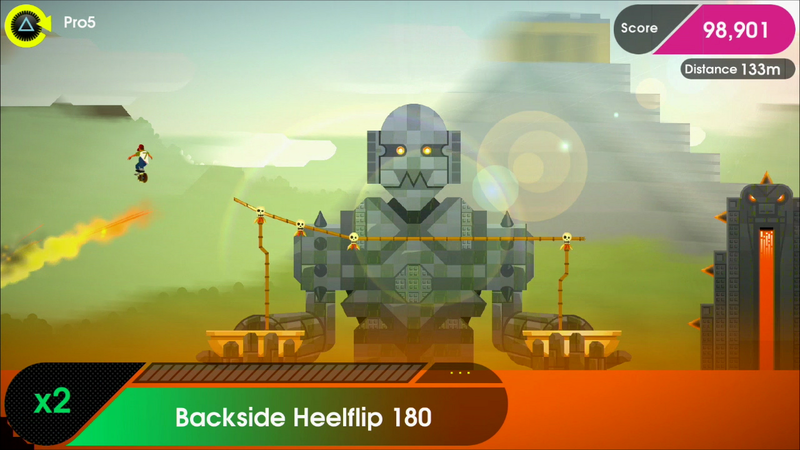 OlliOlli2 is like SSX Tricky, a evolution of an already great game to an essential play. Challenging in all the right ways and utterly compelling. Like the forementioned games OlliOlli 2 has an fantastic soundtrack and this is equally as good but so far not as memorable. There’s some interesting variety from Chiptune style to trip hop and break beat vibes that work perfectly as you repeatedly try to master the intricacies and nuances of this glorious game. OlliOlli 2: Welcome to Olliwood comes fully tricked out as a proper release with Scoreboards to encourage score chasing against friends and an illusive Platinum Trophy. The later being achievable but damn tough requiring a level of skill and dexterity I no longer possess due to my aged fingers and slower reflexes, that won’t stop me trying for it though. This game should have a warning on the load screen of the PS4 as it’ll rapidity assisted in the eroding of Dual Shocks 4’s left thumbstick. I’d recommend taking preventative measures suggested by Graham & Daz. I can’t blame Roll7 for Sony’s sloppy manufacturing. I’ve no such issue with the PSVita but don’t let frustration cause you to snap your perfect portable pleasure provider. 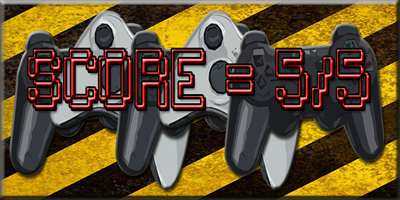 Note: At the time of review I was unable to play the 4 Player slit-screen as it’s not available on PS4 version yet but it sounds like an awesome addition for some couch competition. When it’s added in a future update to an already exceptionally rounded game. Hull based self confessed PlayStation fanboy, never far from his PSvita. 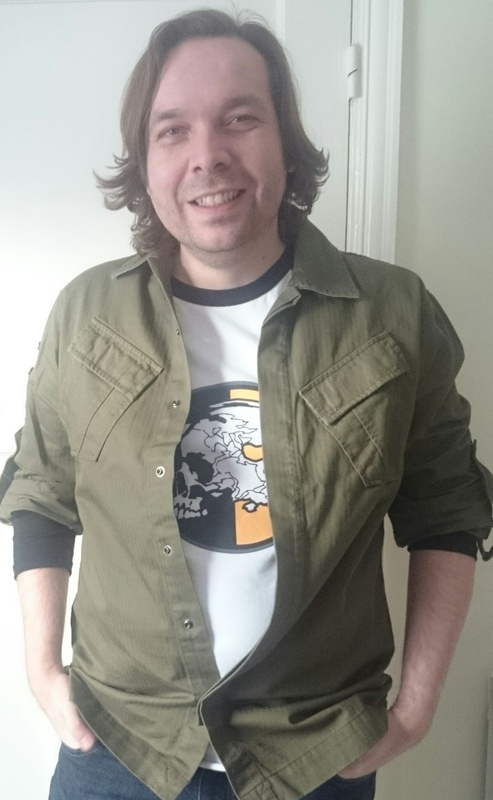 Writer, dev liaison and podcaster for JoypadAndMe.com. Currently trying not to fail his Year Of Shame Challenge.